Buy “The Trout” and I’ll donate 10% of the proceeds to two well-known and deserving organizations. Celebrate with me! I’m commemorating my 25th art anniversary at chigirie.com. 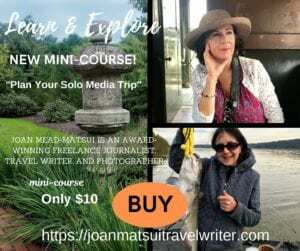 You can purchase “The Trout” in three sizes at joanmatsuitravelwriter.com/shop. Friends and acquaintances who know me well understand why I love to fly-fish but they’re also aware I’m an advocate for responsible fishing, land and water preservation, and the healing effects nature provides. Much of my time on the road is spent fly fishing and appreciating our waterways that Trout Unlimited (TU) has worked so hard to preserve. TU and Casting for Recovery (CfR) will each receive 5 percent of the proceeds from the sale of “The Trout” prints. TU is a national organization that’s at the forefront of fisheries restoration work at the local, state and national levels. 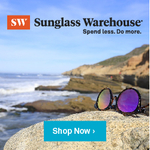 Its 300,000 members and supporters are organized into 400 chapters and councils from Maine to Montana to Alaska with approximately 30 offices nationwide. Over the years, I’ve assisted with TU fly fishing education programs and I’m one of the founding members of my local TU Women’s Initiative. Casting for Recovery (CfR) is a non-profit organization that provides phenomenal healing outdoor retreats for women with breast cancer and at no cost to the participants. Their retreats offer inspiration, connections with other women and of course, one of the greatest healing powers known to mankind, nature. CfR retreats are open to women with breast cancer of all ages and in all stages of treatment and recovery. Women from all walks of life have benefited from CfR’s inspiring program model for more than 20 years with 60 retreats across the country that serve 800+ women each year. CfR partners with volunteers in Canada, UK/Ireland, Australia, New Zealand and Italy and its volunteer teams are made up of medical and psychosocial professionals, fly fishing instructors and alumnae. Click here to learn more about CfR. “The Trout” original was a commissioned piece I created around the same time I took my first fly fishing lesson with my local Trout Unlimited chapter and the PA Fish and Boat Commission. 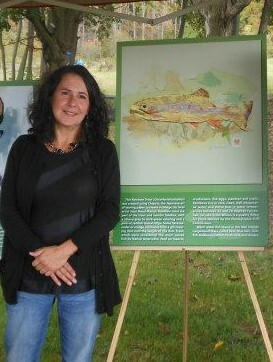 The original trout collage was used to create trail art at a neighborhood community park and I donated the original to the park as an auction item. 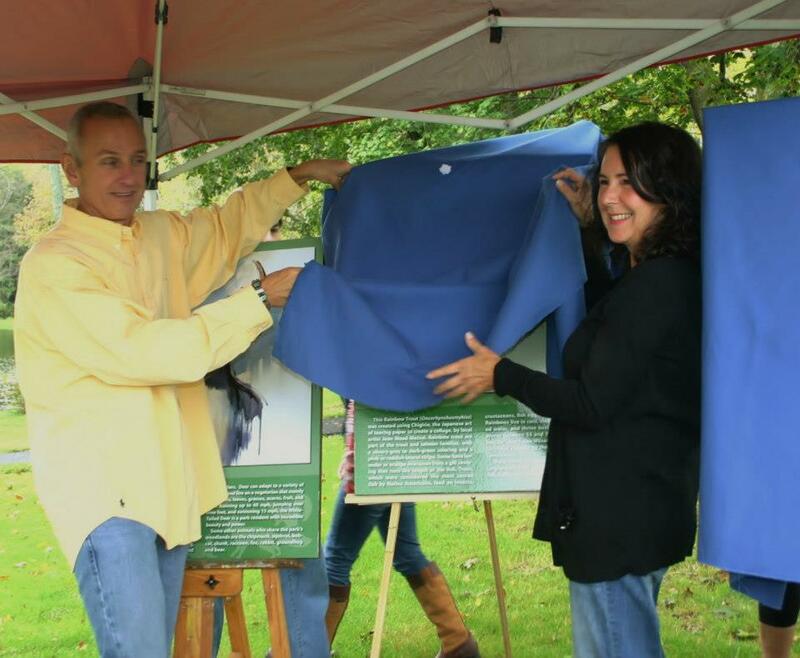 The unveiling of “The Trout” trail art at a community park. “The Trout” is permanently displayed as trail art on a walking trail in Pennsylvania. 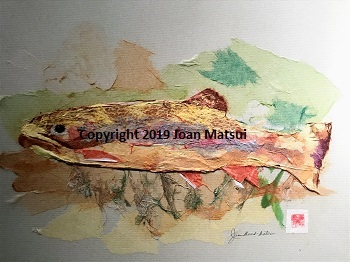 If you’re not familiar with Chigirie, the Japanese art of tearing paper to create a collage (or painting with paper), glance at The Trout and you’ll see 50 or more tiny pieces of pre-dyed torn paper I blended (without paint) to create a layered effect. The Trout is my one and only fishing-related art project and I’m thrilled to be able to offer prints and support TU and CfR.